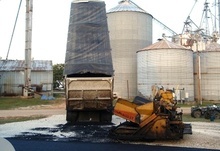 Road repair in the Gilson, IL area | Johnson Trucking And Black Topping Inc.
At Johnson Trucking and Blacktopping, if you need work on your road, we’ve got you covered. 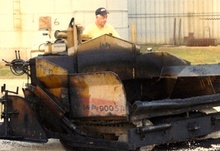 We specialize in both seal coating and blacktopping services including tar and chip. From large commercial projects that include courthouses, nursing homes, and hospitals to residential driveways and roads, no jobs is too big or too small for our expert crew. Since 1968, we’ve dedicated ourselves to providing the best road repair services possible. Our staff is highly experienced in serving our local community. We’re as good as the best and better than the rest. We offer seal coating and blacktopping services throughout Gilson and Knox Country, Illinois and beyond. We serve clients within a 60-mile radius of Galesburg, IL but we’re also willing to travel greater distances to complete a larger project. Contact us at 309-876-2291 to ask about a FREE estimate on your project and to discover our unbeatable prices. Johnson Trucking and Blacktopping has completed seal coating projects for a variety of commercial and residential customers. Seal coating will extend the life of your driveway, parking lot, or road by protecting it from inclement weather, oil leaks, UV damage, and the effects of regular wear and tear over time. A properly built road that’s maintained and sealed can last for years without having to be replaced. We use only the highest quality asphalt emulsion sealcoats, including Pitch Black®. This special formula allows us to sealcoat your road much quicker for more efficient project completion. Don’t put off this important service—let us put our experience to work for you. Our blacktopping and tar and chip services are available for everything from driveways to roads. 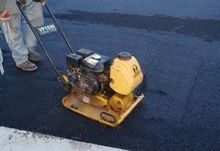 Blacktopping is usually used for driveways, and helps to optimize drainage. Our staff is highly experienced in preparing, grading, and paving driveways, and we take pride in consistently offering our customers outstanding work. We follow the 2-inch industry standard for material depth when paving. To ensure proper drainage, we use a laser to take accurate grade measurements. Depending on the nature of the terrain it’s built on, a driveway can have a lifespan that ranges from 10 to 25 years. Tar and chip (or chipseal) refer to the pavement surface on roads that aren’t heavily used, such as farm lanes and the back roads often found in rural areas. Johnson Trucking and Blacktopping has years of experience in tar and chip paving, and we are confident that we can provide you with service that’s as good as the best – and better than the rest!